Pumpkin Swirl Brownies, homemade from scratch with chocolate chips, are moist, incredibly delicious, and possibly the best fall dessert I’ve ever had! Pumpkin Swirl Brownies may be the best damn brownies I’ve ever made. I like pumpkin but I don’t love it. I’m the kind of person who would scrape off half of the filling on a piece of pumpkin pie so I could properly enjoy the best ratio of crust to filling to whipped cream. These brownies, however, are incredibly moist and down right delicious. Is it the combination of chocolate and pumpkin? Is it because of the mini chocolate chips that create the perfect crunch against the super soft pumpkin layer? Is it the visually pleasing swirl? I say YES. One thing I was afraid of messing up was the swirl. You see, the chocolate batter is much thicker than the pumpkin batter. What I ended up doing was spreading half of the chocolate batter on the bottom, covering it with the pumpkin batter, and then squeezing the remaining chocolate batter out of a plastic bag with the corner snipped off to make rows. Then I took a knife and went through the rows to try for a swirl patter. Then I just swirled it around some more. It wasn’t like a perfectly crafted latte with a gorgeous pattern on top, but it mixed it well. Whatever. 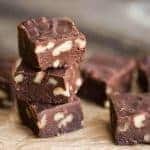 Edited to add that I first made and posted these brownies two years ago but they were so delicious that the post deserved an update and a video (see below). My swirl technique as improved! The first time I made pumpkin swirl brownies, I roasted my own fresh pumpkin. When I recently re-made them for the video, I used organic canned pureed pumpkin (not pumpkin pie filling). I will always think the flavor and texture of homemade roasted pumpkin are far superior to canned pumpkin, but let’s be honest – these are so good you can’t really tell. 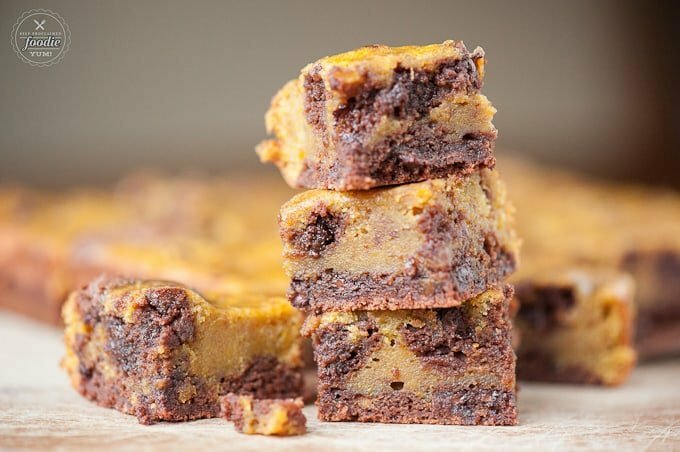 These pumpkin swirl brownies always cook to perfection, and because I lined my baking stone with foil lined parchment, they lifted out easily for perfect cutting. I had a friend at work who normally doesn’t like pumpkin desserts try one of my pumpkin swirl brownies. Later that night his wife messaged me and asked when the recipe would go up on the blog. 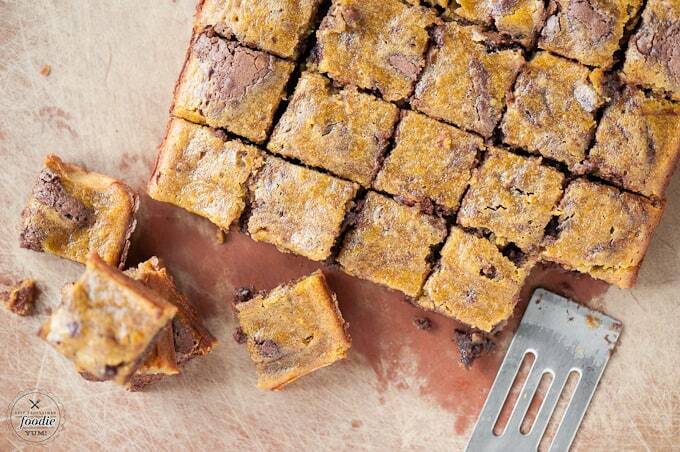 These are the kind of pumpkin brownies that could turn a non-pumpkin lover into a pumpkin lover. They were so good, in fact, that I wish I hadn’t brought half of them into work to share with my co-workers, despite the fact that I probably ate a third of what I brought in. No. These were so good that I would have worked out twice as hard and walked twice as far just to eat the entire pan myself. I will also add that these work great stored in the freezer. I just slide the entire batch into a large freezer bag and keep them on the top shelf away from little hands (i.e. my kids). Then, whenever I have a craving I grab one. 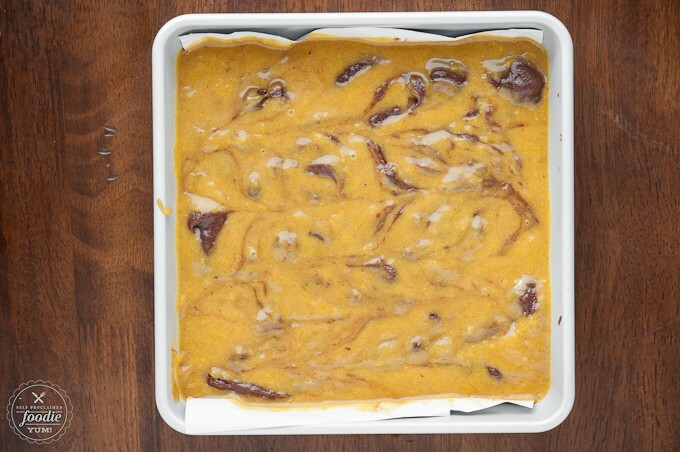 The pumpkin layer is so soft that the entire brownie remains soft, even when frozen! Brown the butter. 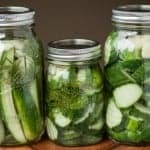 I list this step in the recipe. Can you just melt the butter? Sure you can. 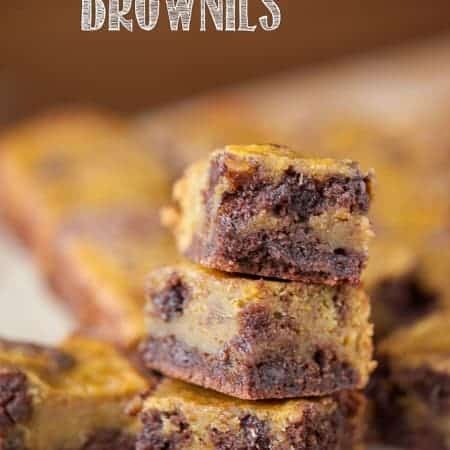 But when you take it that extra step and start turning the milk solids to a golden brown, you bring out the nutty caramel flavor that will take your brownies, or any baked goods, to the next level. Make sure you use a good silicone scraper. You never want to leave any batter in the bowl unless, of course, you want to use your fingers to lick it. Guilty. Use a plastic bag to squeeze the chocolate batter on top of the pumpkin. I found that the swirl pattern turned out even better when I made the video, so I recommend squeezing it out into an “s” pattern rather than lines like I show in the photos. Highly recommend using that parchment/foil paper (link is below). Helps you lift the brownies right out of the pan. Love that stuff! Pan lining paper: Anytime I make a baked good that I will want to take out of the pan and slice or cut, I almost always use this foil parchment pan liner. Knives: There is nothing more frustrating than having to use a poor quality knife. I’ve been using this set for years. I found it to be affordable yet incredibly durable and versatile. Whether you’re filleting a salmon or slicing a super ripe tomato, these are great knives for the everyday chef. Even though a sharp knife isn’t technically needed to cut brownies, I still recommend you always use a good one! Square baking pan: This is definitely a kitchen must-have. I use mine to bake all sorts of great recipes from cakes to cornbreads to brownies. 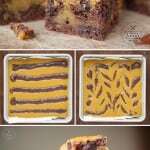 Not only are these Pumpkin Swirl Brownies fun to eat, they’re fun to make! Especially the swirl part. 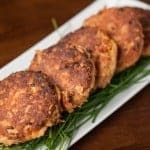 Watch me make them in the recipe video below! 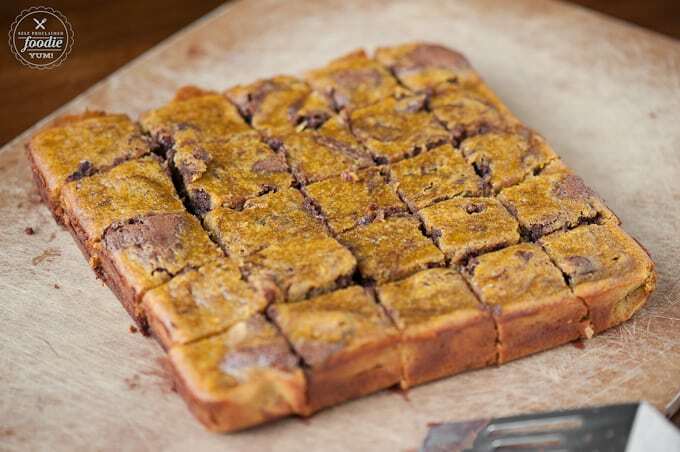 Pumpkin Swirl Brownies, homemade from scratch with chocolate chips, are moist, incredibly delicious, and possibly the best fall dessert I've ever had! Preheat oven to 350 degrees F. Line or grease an 8x8 inch baking pan. Stir the flour, baking powder, and salt together in a bowl. In a medium sauce pot over medium heat, melt butter. Continue to cook while it foams and stir constantly until it browns and you see some brown specks at the bottom and it starts to smell a bit toasted (i.e. heaven). Remove from heat. Once butter cools a bit, add sugar and vanilla extract. Next, beat in the eggs one at a time with a spoon. Gradually add the flour mixture, and stir the batter until it's evenly moistened. Add half the batter to a separate large bowl. Into one bowl of batter, blend the cocoa powder and chocolate chips. In the second bowl of batter, stir in the pumpkin puree and pumpkin pie spice. Spread 1/2 of the chocolate batter into the bottom of the prepared baking pan, and follow with all of the pumpkin batter. The chocolate batter will be much thicker than the pumpkin batter. For the remaining chocolate batter, you can either spoon it on top or you can put it in a plastic bag, snip off the corner, and squeeze it onto the pumpkin in strips. 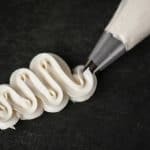 Use a butter knife or a spatula to swirl the two batters together to create a marbled appearance. Bake in the preheated oven until the brownies begin to pull away from the sides of the pan, and a toothpick inserted into the center comes out clean, 40 to 45 minutes (mine took exactly 40 minutes and they were perfect). Cool in the pan, cut into squares, and serve. This sounds amazing! Could the butter be replaced with coconut oil (melted)? 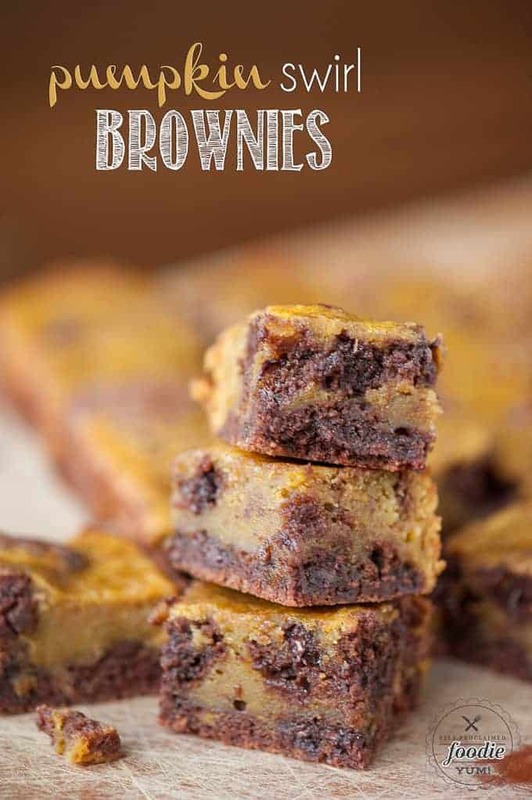 Can you double this recipe to make a 9×13 pan of brownies? How long would you bake a double batch? If you’re using a larger pan, I imagine you won’t have to adjust the time that much. I depend 100% on my nose and a toothpick. Base your toothpick observation on the chocolate portion of the batter though, not the pumpkin as the pumpkin layer is much softer.